Here is letter which puzzled me - until I looked at it more closely. Now I think I may have an explanation. 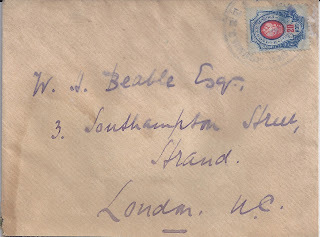 On the front, the letter is addressed to London.There is a 20 kopeck stamp with a violet seal cancellation. 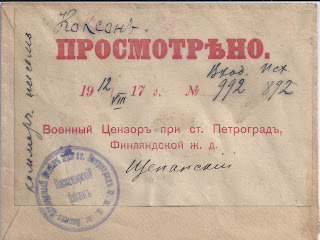 On the back, there is a large "Examined" label applied at the Finland Station in Petrograd and dated 12 VIII 17, so during the period of the Provisional Government. In the bottom left corner is the same violet seal. The label and the seal are designed for use in the Examination of Passenger Baggage - in the centre of the violet seal it says simply "Passenger Baggage". So someone leaving Russia from the Finland Station had their luggage examined and this letter was found and opened (there is a large wax seal under the label). A comment was added on the left of the label which I read as "Commercial correspondence"
But what about the stamp? 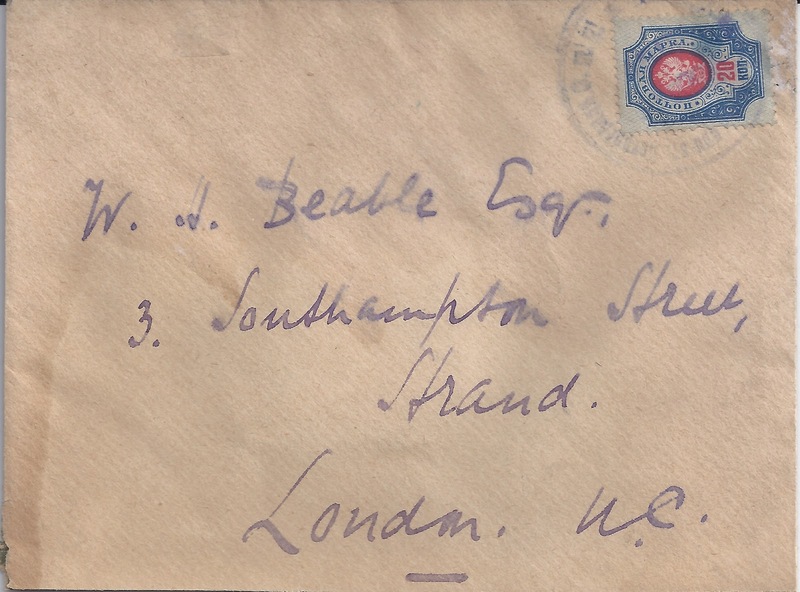 One possibility is that the traveller had prepared this letter for sending, put on a 20 kopeck stamp [ Correct for a Registered letter to London], but did not have time to get to the Post Office - so decided to carry the letter instead. The Censor simply decided to cancel the stamp. Any other suggestions? Whatever the truth, this is certainly a most unusual item!